« About Elephants and Pigeons in Congo’s Forests. The GPS unit (Global Positioning System) has become part of our western way of life—or really—our international way of life, a little hand-held box that will tell me on which square meter of earth I am standing. These units are fixed in cars and in planes. People take them on hikes and on sailboat cruises. Like the internet and 1-800 numbers, GPS makes our world smaller, less enigmatic. Those born after 1980 think of “over the hill and through the woods to grandmother’s house” as a GPS track-log on a google map. 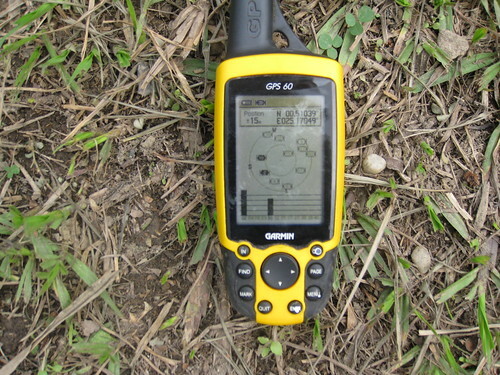 One of our GPS units at our base in Kisangani. 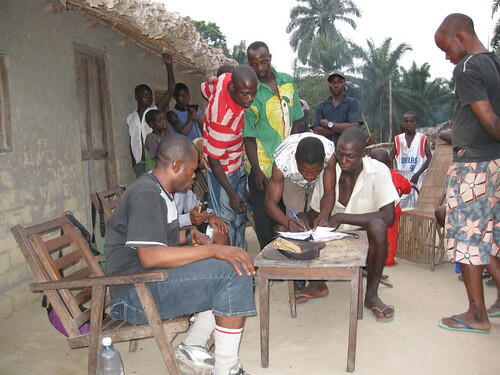 In Congo’s forests it takes extra effort to get the same result from a GPS unit. Not all units can handle reception through the forest canopy and an extra antenna is needed even for the best adapted unit, such as the Garmin GPS 60 pictured above at our base in Kisangani (00.51039 N, 25.17849 E is the waypoint). 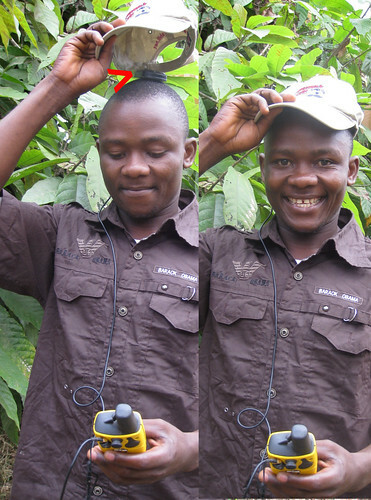 For forest work we fix the antenna under the hat (demonstrated by Mpaka below). Hands are thus free for pencil and notebook with the GPS unit stashed in a pocket. Note: Mpaka’s pocket label is Barak Obama – a popular symbol of hope here in DR Congo. The red arrow points to the antenna on Mpaka’s head, fixed in place by his hat. Team leaders are responsible for the GPS track log. Throughout the inventory stage of our project every observation path cut through the forest took track points automatically every two minutes. This map shows in purple and red the track logs from our first 2 years of exploration. Thanks Nick of CAA for the great map. Along these tracks an additional GPS waypoint was taken for every observation whether a bonobo nest, elephant dung, or poachers camp. These waypoints can then be mapped to show density of specific sightings in different areas. 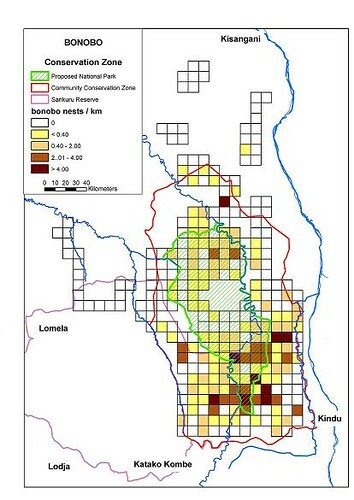 Above a map of bonobo presence based on nest sightings per 100 sq km block. Now that we are in phase two of the project our efforts turn around villages and human activities, but the GPS is just as essential. 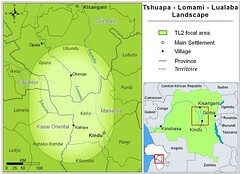 It allows us to map the distribution of human population as well as threats to the TL2 conservation area. In April, May and June of this year 2009, Maurice and Crispin took off with a GPS unit to examine human activity around the bonobo forest. Their mission: make sure no hunting is happening in the conservation area, make sure no protected species are being killed anywhere (bonobo, elephant, red colobus….etc) and let everyone know that there soon will be a no hunting season (It started in Maniema on 1st July and lasts through September). 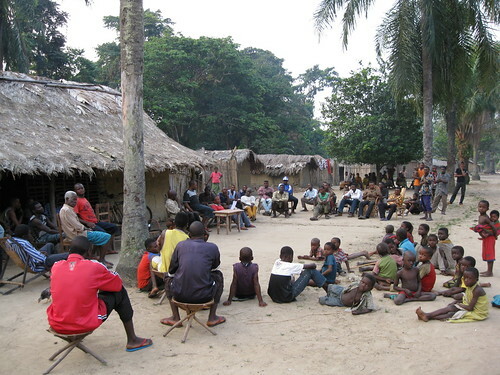 Maurice and Crispin call a village meeting in Ngondo — east of the conservation area. 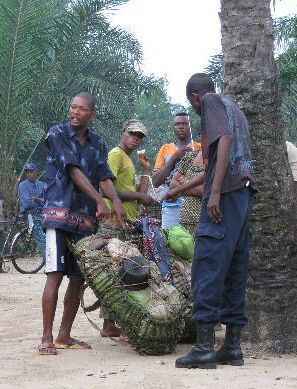 They went from village to village in the Bagengele tribal area. Although there are no villages in the conservation zones, hunters enter from the surrounding villages. We knew that “foreign” hunters came in from across the borders of territory and province. We needed the help of the local people to move them out. In the village of Djekoshilo the heads-of-households sign a statement that they will allow no more commercial hunting in their forests. In Oluwo they met a police officer who searched packs of bushmeat in the presence of Crispin and Maurice, looking for evidence of protected species. Crispin and Maurice crossed the critical area we hope will soon be national park between the Loidjo and the Lomami and ended up at Chombe Lombe. 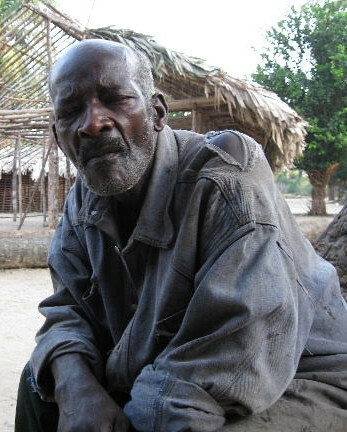 Vieux Makongo in Chombe Lombe remembers when elephants were abundant, now there are almost none in the Bangengele area. They also followed a path off to the west of the TL2 area because these villages send hunters east into the critical forest. 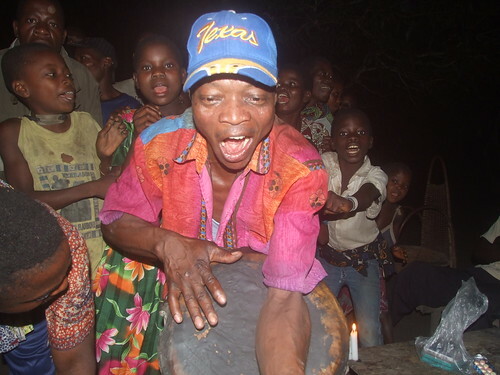 In Wemba Mbuli they were greeted with song and dance. Visitors are uncommon along this road. Mainly hunters coming into their forests from far away. There is little evidence that even the 20th century is underway, let alone the 21st. Only two of 11 villages had any kind of health worker and only four had an elementary school. Of these four only one had a teacher who had actually finished high school. There were over 6000 people living along this path of about 50 km in length. 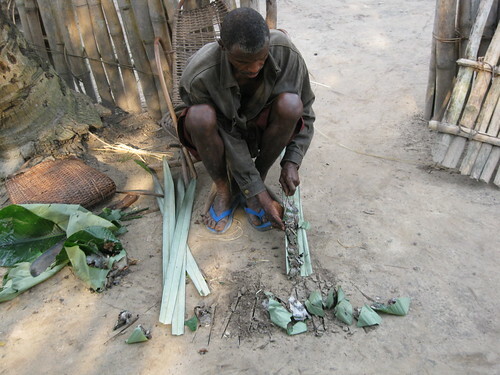 This man near Mangazumbu fastens hardened tree-sap called kasuku into bundles to burn as a bright torch. A functional electricity substitute for lamps, but won’t help with the computer. Crispin and Maurice accompanied the villages who torched the hunting camps of foreign poachers. This post was put together from the photos, waypoints and report of Maurice and Crispin. Location of villages on Google Map. This entry was written by Terese Hart, posted on 2009-07-28 at 12:20 am, filed under About the project, Bushmeat, Elephant. Bookmark the permalink. Follow any comments here with the RSS feed for this post. Post a comment or leave a trackback: Trackback URL. Interesting this power of “law enforcement”. around 70000 km2 – safe from logging? Interesting that bonobos are more numerous in the forests close to the savanna. This is a pattern that can be seen near Lac Tumba in the Lediima Community Reserve, too. 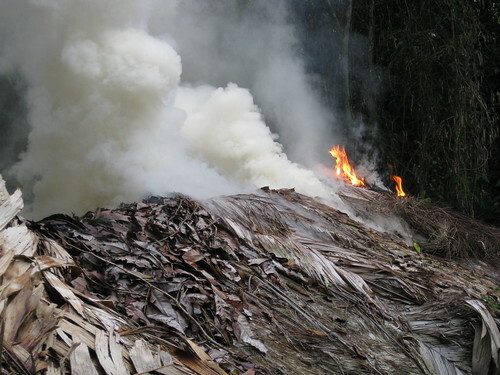 The difference between logging and bushmeat hunting is that the former needs significant investment and a means of timber evacuation. There would be people to invest in chainsaws if there were roads and markets close enough to make logging profitable. That is not yet the case. In Eastern Congo (with Ugandan markets near by) there are many smallscale logging operations and one commerical logging outfit. 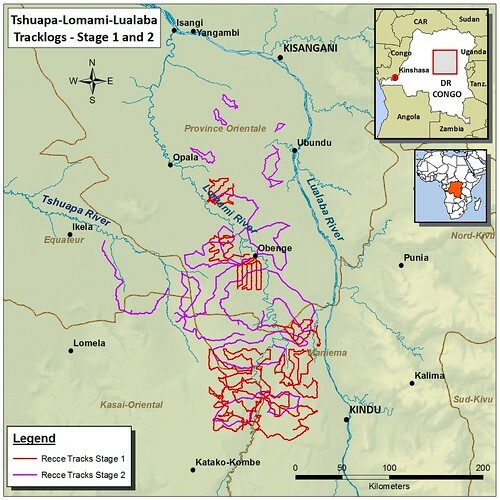 Other than that almost all logging is on the congo downstream from Kisangani or accessible by nearby tributary. With current road and transport conditions – TL2 and Sankuru are too far away to be profitable. Ultimately they will need to have active protection against logging — but not yet. Bushmeat on the otherhand is a commerce within reach of many. hand-made 12 caliber rifles and dried meat back-packed to markets or carried on bicycle constitutes a profitable enough trade that most of the forests of Sankuru are defaunated…except those closest to the Lomami. And the TL2 forests require a massive effort to save their fuanas before it is too late.